Yard Gard Multi-Animal repellent is designed to deter a variety of animals that forage for grubs, insects, and other underground food. These animals have a keen sense of smell and we use their senses against them by creating a barrier in the soil that sends them away. Our all natural repellent is made from all organic ingredients so that your family and pets are safe. 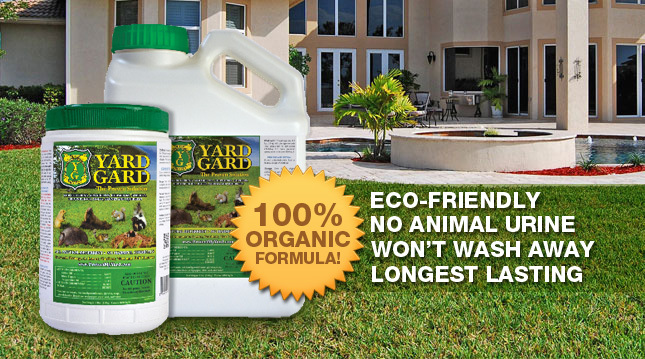 Yard Gard Multi-Animal repellent removes digging critters from your yard safely and effectively without harmful chemicals. See more general information on squirrels below. If you need any additonal assistance don't hesitate to call our experts at 1.855.665.3746. The primary natural foods of these creatures are nuts, fruits, buds of hickory, pecans, walnuts, elm and mulberry trees and field corn. To bury a nut, a gray squirrel digs a hole about 3 to 4 inches deep, puts the nut inside, pushes it down whith its nose, and then pulls the soil over it with its front paws. Because of this type of feeding habit squirrels can make a mess of your yard. Yard Gard has proven to deter the squirrel from the areas treated with Yard Gard Multi-Animal Deterrent.